As the mother of an almost 14 month old toddler I am familiar with the mummy blogger tribes that fill instagram feeds with honest pictures, witty captions and links to hilarious blog posts. In fact, some of these bloggers helped me through some of the lonelier days of my year long maternity leave so when I saw that Helen Wallen of “Just a Normal Mummy” had turned her hand to fiction I couldn’t wait to get reading. 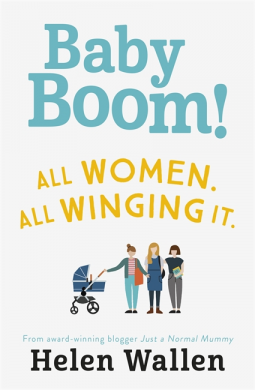 “Baby Boom!” is written in the same warm, inclusive, yet honest tone of the blog. It’s not a book interested in choosing sides when it comes to the best way of parenting, or even handling pregnancy and for that reason it was a refreshing read. Following three best friends in their late twenties/early thirties, two of whom become pregnant in very different situations, the book explores the highs and lows of pregnancy, relationships and motherhood. For me, one of the nicest parts of this book was the friendship between Emily, Liz and Molly which was portrayed in the most natural and real way. Their Whatsapp conversations were hilarious to read and really made me feel as if I were a part of their friendship. Most strikingly though was the fact that at no point did the book become about them falling out. Before reading this book I didn’t realise how big a feature of women’s literature best friends having arguments is. Of course friends do argue, but in this instance it was just nice to have three women, in very different situations supporting each other in the best way they could above all else. The only part of this book I didn’t love was the poetry at the beginning of each chapter which I find a bit twee. This type of poetry isn’t to my taste and I felt like they were a bit unneccesary to the book. However, I know a lot of “Just a Normal Mummy’s” followers enjoy her poetry within her blog so I understand why it has been included. I wish I’d had this book to read on maternity leave, in that stretch of time before you have your first baby when you finish work and have nothing to do but wait for your baby to be born. That time when you only really want to be occupied by baby related things but also need to stop thinking about your impending labour before you go mad. It’s the perfect escapism and I will be buying a copy for any pregnant friends in future to enjoy.